Uncorrected proof of the first American edition. Signed by J.M. Coetzee on the title page. Fine in wrappers as issued. "I have known few authors who can evoke such a wilderness in the heart of man. He is an artist of a weight and depth that put him beyond ordinary comparisons...Coetzee knows the elusive terror of Kafka" (Sunday Times). The Humanities in Africa/ Die Geisteswissenschaften in Afrika. Munchen: Carl Friedrich von Siemans Stiftung, 2001. First edition. Octavo, original illustrated wrappers. Signed by J.M. Coetzee on the title page. In near fine condition. Commonwealth: Essays and Studies, J.M. 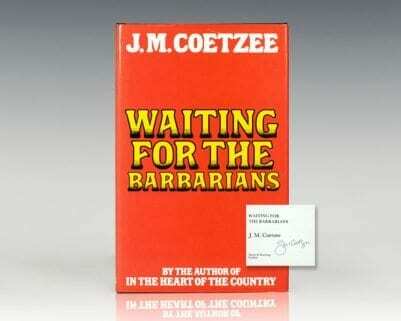 Coetzee, Waiting For the Barbarians. Dijon, France: Editions Universitaires De Dijon, 1992. First edition of this collection of essays regarding the Nobel Prize-winning author’s classic Waiting For the Barbarians. Octavo, original wrappers as issued. Association copy, inscribed by the author, “To J.M. Coetzee with much admiration for his imaginative powers. Jean-Pierre Durix 25 October 1999.” In near fine condition. From the library of J.M. Coetzee. London: Secker & Warburg, 1994. First edition. Octavo, original blue cloth. Signed by the author on the title page. Fine in a near fine dust jacket. African Road: New Writing from Southern Africa 2006. Claremont, SA: Spearhead/ New Africa Books, 2006. First edition of this collection of short stories. Octavo, original illustrated wrappers. Signed by J.M. Coetzee on the title page, who selected these stories. White Writing: On the Culture of Letters in South Africa. First South African edition, which precedes the American edition. Octavo, illustrated wrappers as issued. Signed by J.M. Coetzee on the title page. In fine condition. Life & Times of Michael K.
New York: The Viking Press, 1984. 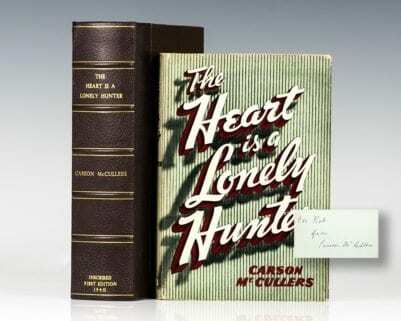 First American edition of the author’s first Booker Prize-winning novel. Octavo, original half cloth. Signed by J.M. Coetzee on the title page. Fine in a fine dust jacket. Jacket design by Bascove. Diary of a Bad Year. First British edition of this groundbreaking novel. Octavo, original boards. Signed by J.M. Coetzee on the title page. Fine in a fine dust jacket. Doubling the Point: Essays and Interviews. Cambridge: Harvard University Press, 1992. First edition of this collection of essays and interviews by the Nobel Prize winning author. Octavo, original illustrated wrappers. In very good condition. Signed by J.M. Coetzee on the title page. London: Secker & Warburg, 1980. First British edition, preceding the South African first of this modern classic by the Nobel Prize-winning author. Octavo, original cloth. Signed by J.M. Coetzee on the title page. Fine in a fine dust jacket without the usual sunning to the spine with a small closed tear. An exceptional example. First edition of the Nobel Prize-winning author’s first book. Octavo, original cloth. Signed by J.M. Coetzee on the title page. Slight spine lean, near fine in a near fine dust jacket with just a touch of rubbing to the extremities. A very sharp example. First edition of the Nobel Prize-winning author’s first book. Octavo, original cloth. Signed by J.M. Coetzee on the title page. Tape offsetting to the front and rear endpapers and to the dust jacket flaps, a good copy in the original dust jacket with some light rubbing. Second printing preceding the South African first of this modern classic. Octavo, original cloth. Signed by J.M. Coetzee on the title page. Fine in a fine dust jacket with a touch of toning to the spine. First edition of the Nobel Prize-winning author’s first book. Octavo, original cloth. Signed by the author on the title page. Near fine in an excellent dust jacket that shows some light soiling to the extremities. Summertime: Scenes From Provincial Life. First British edition of the third and final volume in Coetzee’s fictionalized memoir. Octavo, original boards. Signed by J.M. Coetzee on the title page. Fine in a fine dust jacket. South Africa: Raven Press, 1983. First edition of the author’s first Booker Prize-winning novel. Octavo, original cloth. Signed by J.M. Coetzee on the title page. Fine in a near fine dust jacket. Bennington, VT: Bennington College Chapbooks, 1997. First edition of this essay by J.M. Coetzee. Octavo, original wrappers, as issued. 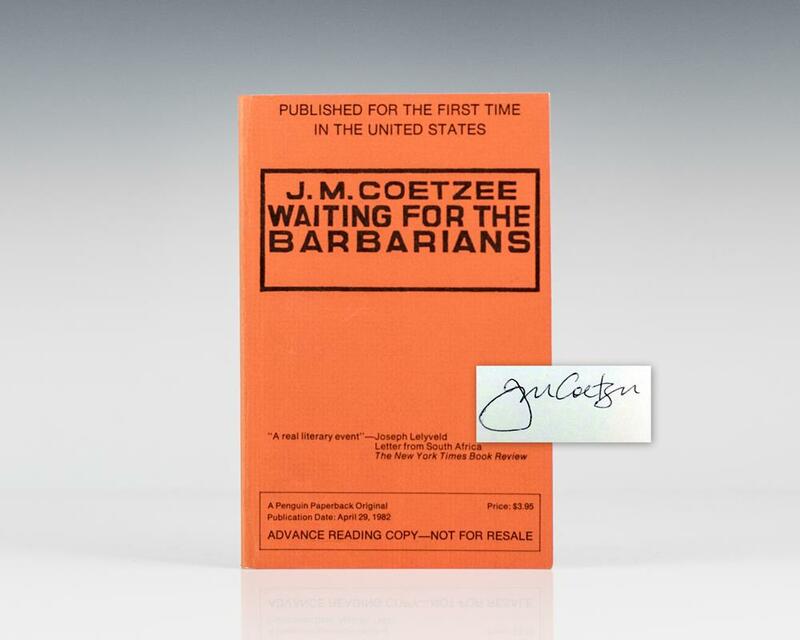 Although not called for, this copy is signed by Coetzee. Fine in wrappers. Martha Quest, A Proper Marriage, A Ripple from the Storm, Landlocked, The Four-Gated City. First editions of the author’s Children of Violence Series. Octavo, 5 volumes. Original cloth. Each of the five volumes are signed by Doris Lessing. Near fine in very good to near fine dust jackets.